I finally did it. I created my first plushie. Well, I maybe made more than that, fourteen to be exact. I am so happy with my little army of Lumas from Mario Galaxy. I followed clearkid‘s tutorial she posted on deviantart, and had a blast making them. It is a great tutorial and a great pattern. Clearkid has another great sewing tutorial on how to make a fleece hat and extras for said hat. 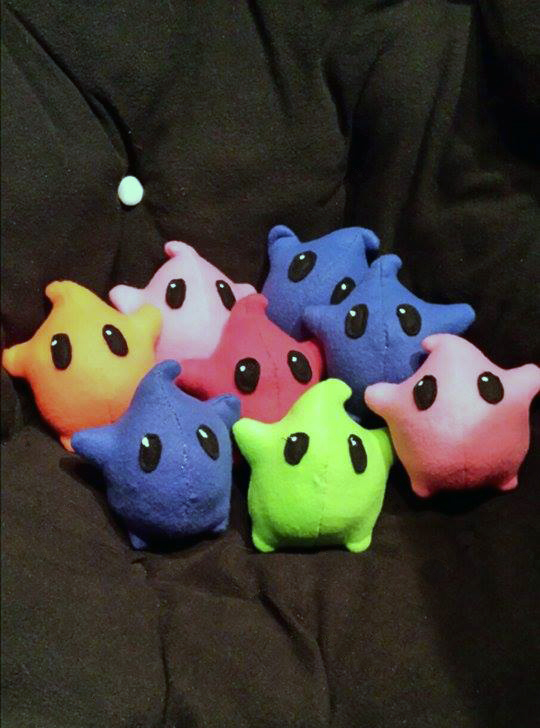 These little Lumas were made as presents for some of my friends and family. I made the Lumas in their favorite color, hence the weird number of each color. I hope they like their homemade Christmas gift. I now have a craving to start creating my own designs, so we shall see where that takes me. Be patient while drawing the pattern unto the fabric. This can make or break the end result if the fabric is not cut right. Practice makes perfect. I still have a long way to go before I make the perfect Luma.